Well it is that time of the year again. Christmas has passed and you are patiently waiting for the New Year. You are wondering why you ate as much as you did over the holiday, and you are contemplating about your 2015 New Year’s Resolution. I don’t know about you but I find it very hard to fulfill resolutions. I actually don’t like the word resolution when it comes to discussing the New Year. Resolution is an answer to a problem. I don’t like the word problem either. We don’t have problems, we have setbacks. Setbacks are temporary with the right mind set. The right mindset requires a positive attitude. 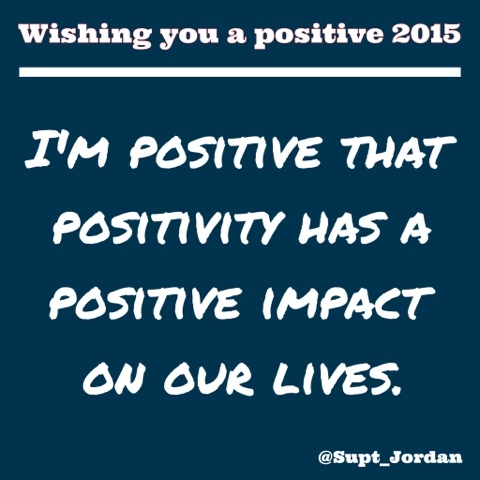 I’m positive that positivity has a positive impact on our lives. So I have decided that for 2015, I’m not going to have a resolution. However, I’m challenging myself to simply be more positive. I have come up with my own top 10 version of how to have a positive 2015. I challenge each of you to follow these 10 simple tips and join me. 10. Seek out the good in everything. It is easier to see negatives, so challenge yourself to find the positives in every situation. 9. Be a leader. You do not have to have a leadership degree to do this. We can all be leaders. 8. Be healthy. This is better than a resolution to lose weight. Challenge yourself to eat healthier, and exercise more. A healthy body equals a healthy mind and vice versa. 7. Glorify good news. If you are in the business of telling stories, tell positive ones. The more positive stories the more positive people. The more positive people equals a healthier society. 6. Talk less and listen more. I have nothing more to write here. 4. Compliment somebody every day. It’s always nice to get a compliment and to know that you matter to someone. You do matter – you know that right? 2. Limit the time you spend on your technology gadgets and increase the time you spend with family. 1. Have a conversation with somebody different every single day of 2015. A simple hello can go a long ways. So instead of finding a resolution or fixing a problem, I challenge each of you to practicethe ten things listed above for 2015. I place strong emphasis on the word “practice,” as I’m fully aware that some days are just better than others. I truly believe that if we strive to be better and do better the world in which we live will get better. It’s actually quite simple.